Our friend Charla Jeter Milligan is the Associate Director of His Heart Ministries in Jackson. She’s a Carey and Truett girl and a good minister. From time to time she sends me “kid stuff” parables. I confess to stealing them for my sermons. She sent me one yesterday that is appropriate for this time of year. 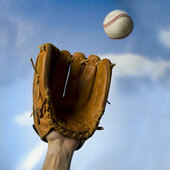 Baseball is in tha air and we have many lessons to learn from the great game. I admit – this one made me cry. Yes, there is crying in baseball. If you’ve ever played you know it’s true. Read ‘em and weep poker players.